Billionaire Charles Koch is not known for being a friend of the Catholic Church, so why are his recent donations changing the business school’s curriculum, and his recent publications getting him a three-day conference at the school? Koch is well-known for being a leader of the national Libertarian Party, which calls for cuts to welfare, Social Security, and Medicaid programs, to name a few, and opposes environmental regulations. This goes against the Catholic Church’s support of the poor and the environment. 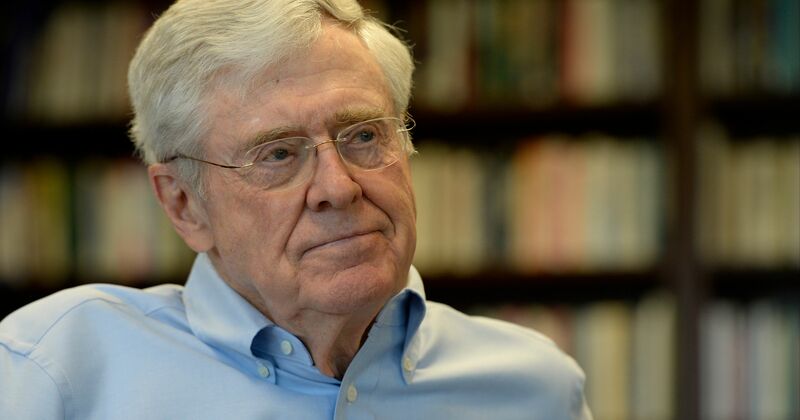 Koch claims he isn’t religious, but he preaches his libertarian gospel with the vigor of a fire and brimstone sermon. In 1980, during his brother’s bid for the vice presidency, Koch and his company called for a 50% tax break to the rich, ending taxes on oil companies, and decreasing federal regulation. After being unsuccessful on the political ballot, the leaders of America’s second largest private business have now started to expand their empire into the higher education field. Koch’s generous donations to business schools in colleges and universities almost always include some changes to curriculum. In the case of the College of Charleston in South Carolina, the Charles Koch Foundation included a stipulation that mandated the names and emails of all students who participated in the business program be sent to Koch’s philanthropic foundation. The Catholic University of America is no exception to this pattern of large donations driving changes to curricula. Principled entrepreneurship is Koch’s trademarked theory of “maximizing long-term profitability for the business by creating real value in society while always acting lawfully and with integrity”. The articles on the Catholic University’s website detailing Koch’s donations of $1 million in December 2013 and $1.75 million in January 2015, mention that students would be studying this philosophy of “principled entrepreneurship”. Mentions of Koch’s theory are nowhere to be found on the website before the donation. Koch’s most recent donation of $10 million in April 2016 is the second largest donation Catholic University has ever received. The donation was part of a combined $47 million dollar contribution from Koch and other sponsors that allowed the Busch School to finish renovations of their new building. Pope Francis also expressed his disdain for global capitalism and the free market system, which he calls the “deified market”, in the same publication. “In this system, which tends to devour everything which stands in the way of increased profits, whatever is fragile, like the environment, is defenseless before the interests of a deified market, which become the only rule,” Francis wrote. The Catholic Church doesn’t often make its opinion on U.S. politics known, but it is known that it doesn’t support advocating for policies that don’t help the lower class and opposing environmental regulations. Why is The Catholic University of America letting the views of a non-religious billionaire be taught over the teachings of the Catholic Church? And Koch, why didn’t you throw your hat in when the Busch School was looking for a new dean in 2015? You wouldn’t have to go through school administrators to determine the curriculum then, and you’d be closer to the city you’re trying to run, too. Next → Next post: Saving Money, But Not Students? This article is not very well researched. Charles Koch has never been affiliate with the Libertarian Party. His brother David was the LP candidate for Vice-President in 1980 but neither brother has been involved with the party since the mid 80’s. What the Koch’s are known for is giving lots of money to Republicans with far from libertarian credentials. Is Good Profit a True Prophet? The conference, “Good Profit” held at Catholic University last week and named after presenter Charles Koch’s book Good Profit should extol the Catholic Church’s teachings on Labor, especially when Cardinals and Bishops are in attendance. Pope Francis, describes work as a form of “civil love” in “a new human social pact for labor.” He also praised unions as “prophetic” institutions that give “a voice to those who have none…” Further, the Catholic Church officially supports labor unions in 4 Papal Encyclicals by Pope Leo XIII, Pope Pius XI, and Pope Saint John Paul II. “Good” at a conference like this should be defined in compliance with Catholic Social Teaching on the Labor facilitating the profits. Other Course Materials for the Good Profit Conference were: Pope Francis and the Caring Society by Robert Whaples; and Force For Good : The Catholic Guide To Business Integrity by Brian Engelland. Discussions of Living Wage; Labor Unions; Papal Encyclicals; Rerum Novarum; Right-To-work should be prominent. *David* Koch was the party’s VP candidate in 1980 and helped fund that year’s presidential campaign. At the 1983 convention, the Kochs and those aligned w/ them had a falling-out with the LP and left, and haven’t been back since. Charles Koch hasn’t supported or been involved in any way with the Libertarian Party since 1983. He is most certainly not “well-known for being a leader of the national Libertarian Party.” He hasn’t spent a dime on the LP or had anything to do with it in the author’s lifetime.